Today I decided to sell my Tenori-On. 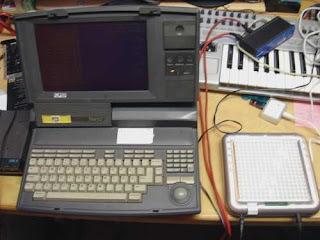 I did not see any development in the Tenori-On during the last year and I decided to write my own software. It is called "Brontologik4". I keep you informed about the release of this software and I will post a link here. 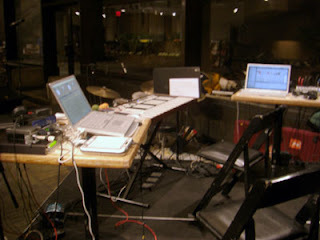 brontologik4 for the monome 256 (preview) from pyrolator on Vimeo. Here you find a nice "paper-tribute" to the tenori-on. On the left side is my computer. 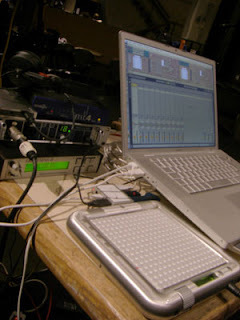 I was using Max/Msp and Ableton Live with an RME Audio-Interface and the Emagic MT4 as the Midi-interface. 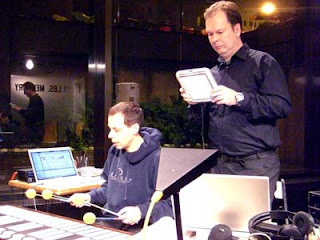 My controllers were the Buchla Lightning II and the Tenori-on. 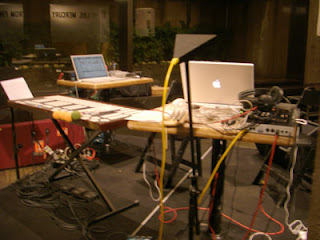 On the right side is Lukas computer, also with Ableton Live controlled by Buchlas Marimba-Lumina. This time I also made an improvisation with the Tenori-On using only the Midi-Out to control different Synthesizers and Samplers in Ableton Live - this was a lot of fun ! I do not like the vertical style and I cannot do anything else on this page. So I decided to make a kind of mixer-page on layer8. Layer8 is one of the Random-Layers and I am not using all 4 of them anyway. The animation of the layer doen`t matter at all, so I put the animation-style to "simple" Size1, that it doesn`t bother me. My blog is: here. (in german). My company: here.